Tag Archives for " Abby Perkins "
It’s guest post day here at Duct Tape Marketing and today’s guest post is from Abby Perkins– Enjoy! There’s more to running a successful business than having an incredible product or service. Those things may generate revenue, but to attract – and retain – loyal customers, you need to provide impeccable customer support. Companies with reputations for taking care of their customers tend to fare much better than those who leave customers hanging. These days, companies of all sizes are upping the customer service ante by being readily available on social media. And now that the practice has been around for a while, one thing is clear: Customers love being able to interact with brands on sites like Facebook and Twitter. Companies that extend their customer support to the social media realm tend to have better reputations than those that don’t. The takeaway? Any business that wants to provide top-notch customer care has to be active on the most popular social media sites. Before you get too excited about providing customer service via social media, make sure you’re in it for the long haul and will actually follow through. The only thing worse than not having a social media presence is having one that’s been abandoned. For instance, if a customer tries to interact with your brand on Twitter and is greeted by crickets – he’s not going to be too happy, and he’s not likely to keep coming back. Your earnest efforts can backfire dramatically without follow-through, so be prepared to give it your all before you start going social. Why Should You Have Social Support? Like many business owners, you may have been drawn to social media by the promise of enhancing and broadening your marketing efforts. Social is certainly a great way to promote a brand, but it requires a different strategy. Traditional marketing efforts don’t fly as well on sites like Twitter and Facebook. People on social media don’t want to be preached to – they want to engage in conversations and interact with their favorite brands. That’s why social media is such an effective way to deliver top-quality customer service. Consumers are used to wading through confusing telephone menus and waiting around for email replies. Through social media, you can surprise them by responding almost instantly to their questions, comments and concerns. And this doesn’t just satisfy the customer, either. It also shows that customer’s followers – and potentially many others – that your company actually cares and is committed to handling customer service issues quickly. Consumers vastly prefer dealing with living, breathing people than with nameless, faceless corporations. Some of today’s savviest companies allow customer service reps to let their personalities – and even photos – to shine through on social media. UPS, for instance, has photos of its customer service reps on its Facebook page, allowing customers to put faces to names. By monitoring social media for mentions of your brand, you can reach out and surprise people in positive and memorable ways. CitiBike, for instance, responded to a customer tweet about a biking mishap by sending him a gift card for a new pair of jeans. The customer responded in kind by tweeting positively about the experience. CitiBike didn’t just make his day – they benefited from the transaction, too. It’s true that people are more likely to post negative online reviews than positive ones – most people aren’t prompted to take the effort to post a review if they were satisfied with the service. But social media is different. When a customer has a positive experience with a brand, it only takes a second to post about it on Facebook or Twitter. When you actively support your customers through social media, you’re more likely to experience this positive word-of-mouth. People like complaining about companies, brands, products and services on social media because it feels good to have an outlet for your grievances. Brands can capitalize on this tendency by quickly responding to negative comments and working to quickly correct them. Because it all plays out in the public social media realm, it’s yet another way for a brand to market itself and promote its image. Which Companies Do Social Support Right? Still not convinced about the benefits of providing social customer support? Just take a look at some of today’s biggest companies to see where social support can take you. Netflix is famous for offering highly responsive and effective customer service. The company trains its employees to use social media to react in real time. JetBlue constantly monitors social media for customers who need help, and has earned a reputation for surprising people with its responsiveness. To ensure people get the help they need as quickly as possible, Nike uses a separate Twitter handle for customer support. If you’re looking for a way to outshine the competition, delivering top-notch customer service via social media is a great place to start. Just remember – don’t drop the ball. If you’re going to do it, do it consistently, effectively and correctly. 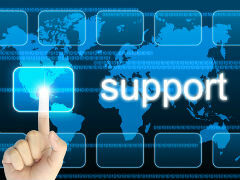 Do you use social media to provide customer support? Tell us about your experience in the comments. Abby Perkins is Managing Editor at Talent Tribune, a SoftwareProviders.com blog.